What To Do About A Smell When Flossing Teeth? As we all know, regular flossing is almost as important as regularly brushing your teeth. We all floss religiously every day, right? Obviously it can be hard to fit it into your daily routine, but it really is something that we should all make the time to do – either the traditional flossing or using a water flosser. Flossing can remove extra particles of food and tartar that just brushing can’t, which can help you to avoid gum disease and bad breath. If tiny pieces of food are left to sit in between the spaces of your teeth, they can attract bacteria which contribute hugely to the causes of decay, gum disease and tooth loss. It is worth being aware of issues that can arise as you floss, and how to deal with these issues. If you notice a smell when flossing teeth, then you may be worried this means you automatically have bad breath. What if people have been keeping their distance from you and you had no idea? Well, the bad news is that yes, this smell can mean that you have bad breath. It doesn’t automatically follow, but chances are that it will, if you don’t get on top of it and sort that stink! A smell when flossing teeth is caused by particles of food, usually meat or some other fibrous substance, that is stuck between your teeth and is basically rotting. Sounds pretty grim, doesn’t it? In the dental world, an “open contact” is what it’s called when, as you floss, you don’t hear a little popping sound as the floss gets between the teeth. There is no resistance, because the spaces between your teeth are wide enough to just let the floss in. An open contact does not necessarily mean you will have smelly floss, or smelly breath, but it does make it easier for food particles to get up in there, and stay there to fester. As we have already discussed, food particles rotting away is what causes a smell when flossing teeth. If you want it in more scientific terms, here goes: The anaerobic bacteria responsible for gum disease are called Volatile Sulphur Compounds, or VSCs. These VSCs are the same anaerobic bacteria that are ressponsible for halitosis, but having them present under the gums does not necessarily mean you are destined to have bad breath for the rest of time. 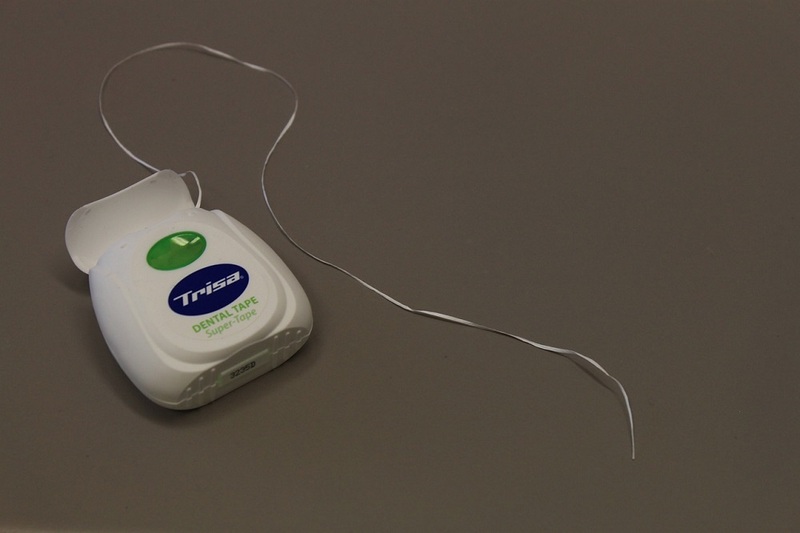 It may sound too simple, but the solution is to floss more! You should also watch a video or two about how to floss correctly; you want to be scraping any leftover particulate off the sides of your teeth, so moving the floss up and down as well as sideways can really help, not just popping it in and out again thinking that you’ve done the job. If you are looking for a more alternative way of cleaning your teeth, Oil Pulling is an ancient Ayurvedic technique that is growing in popularity these days. It involves putting a teaspoon of oil in your mouth, holding it in there and “swishing” it through your teeth and gums for about 20 minutes. It sounds a bit weird, and it can take a bit of practise to get used to the feeling of it, but the health benefits are (purportedly) amazing; ranging from whiter teeth to increased energy levels. Coconut oil is recommended as one of the best, but you can do it with pretty much any oil (although engine oil is not recommended)! Regular visits to your dentist for deep cleaning is another really important thing to do. Going to the dentist can be scary, but it really doesn’t have to be – esspecially if you have kept on top of your cleaning regime so they can be impressed with your progress! A regular check up can help you keep on top of any hygiene issues you may have, and they can also perform a scale and polish, to remove any stubborn calculus and tartar and help keep your gums in the healthiest possible condition. So, if you notice a smell when flossing teeth, it doesn’t mean you have to hide away from the rest of the world, fearing your bad breath coud raze armies. Simply look after your oral health, and floss well, and you can hold your head high knowing that your breat is as sweet as the rest of you.